North Dakota Democratic Senator Heidi Heitkamp is reportedly in hot water after she released someone else’s information without their consent on Tuesday. In a Facebook post Tuesday night, Heitkamp shared her experience meeting Lynn Aas, a World War II veteran. 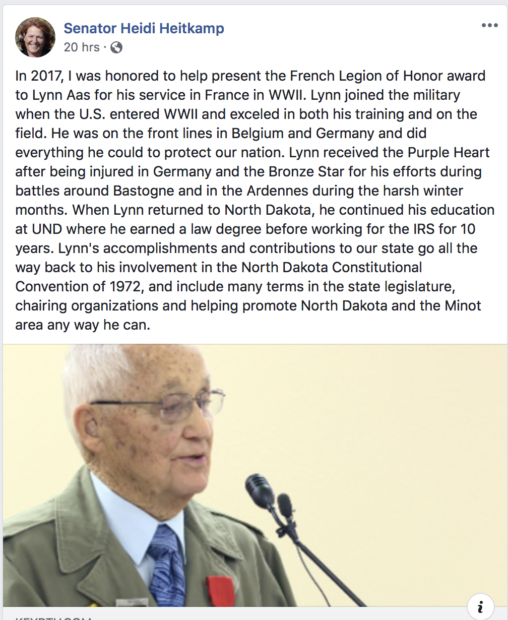 The senator was in attendance for when Aas was presented with “the French Legion of Honor award for his service in France.” The post goes on to describe his service during WWII and him continuing his education in North Dakota. The post was deleted on Wednesday evening. “In fact, at the event, Mr. Aas joked with Sen. Heitkamp that he liked her, but isn’t going to vote for her. They both shared a laugh, and she retold the story at the event. In North Dakota, you can still recognize the service of an honorable man from a different political party without playing politics,” McDonough went on.